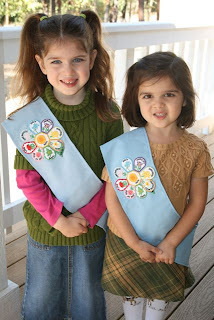 I can't believe we have already completed our 3rd Little Flowers Girls' Club meeting for this year. The time is just flying! We just have two more meetings scheduled before it will be time for our little "winter break" and my babymoon! Unlike our last meeting, where we had all 12 girls in attendance for the first time, this meeting was really small since apparently there are lots of sick children right now. 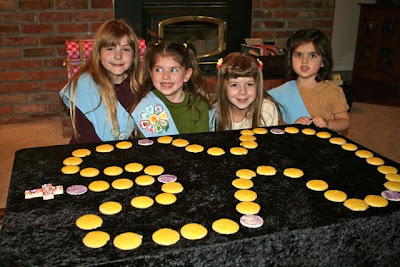 In fact, only 4 girls were able to attend, two of which were my own girls. Nevertheless, the meeting still went great and the girls had a wonderful time! It just proves that you really don't need very many girls at all to have a successful Little Flowers Group. Like I've mentioned before, even if it was just my two girls we would still be having Little Flowers. 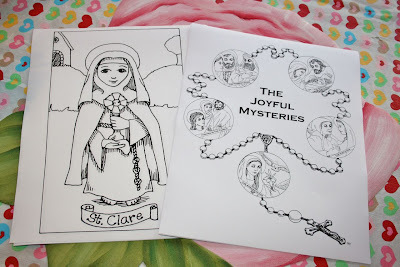 For extra coloring pages this month, we used images from Catholic Artworks. 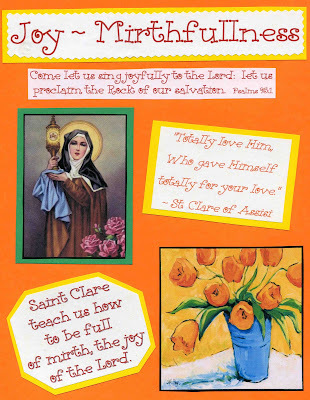 I've had my eyes on their CD-Roms for sometime now (especially since they are the publishers of An Alphabet of Catholic Saints which we've been using Along the Alphabet Path and which I used for making our Painted Wooden Alphabet of Saints! ), and although I hadn't ordered yet, a friend of mine received her order and we printed a couple images for this meeting. My own copies are now on their way!! 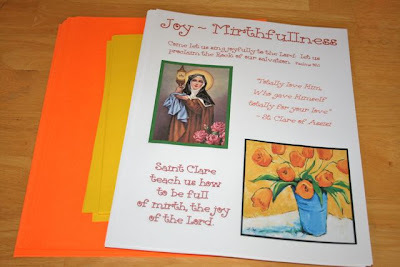 We then moved on to our current months virtue, the virtue of Joy/Mirthfulness, and learned about St. Clare of Assisi. 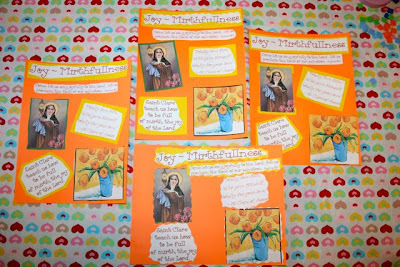 I also decided to expand on the lesson to include a little lesson on the Rosary, since it it October - the month of the Rosary, particularly the JOYful mysteries! Hummm... Perhaps I should have somebody proof read our next 6 pages. Any volunteers? 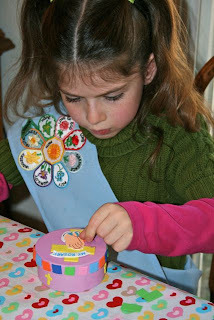 Next we moved on to another craft project. 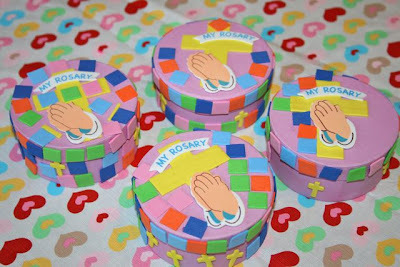 We made Rosary Bead Boxes from Oriental Trading. 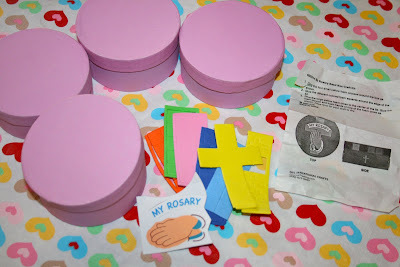 The craft kits I ordered have been so much fun and have really simplified preparing for our meetings this year without adding that much expense and the girls have really enjoyed the addition since they have gotten so fast and efficient at making their notebook pages. Even though Erica had someone sick in her home, she still pulled through with providing the treats for the meeting. Thank you Erica!! Isn't the cookie rosary wonderful?! 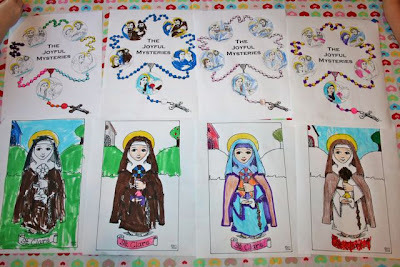 It has been so fun to see all the variations of the Cupcake Rosary this year. Just look at those smiles. Amazingly enough, all those cookies didn't last long, and I only had two... they were so yummy! Well, hopefully everyone will be healthy again soon and we will see you back here in two weeks for our next meeting! I agree....Little Flowers is worth doing no matter the size of group. I wish I would have checked Catholic Artworks site before I ordered the Alphabet book from Amazon. Thanks for sharing the info for homeschoolers. Oh well, there's plenty more to order. I'll add them to my very long wish list. I am so sad we missed it! It looked great and I LOVE the page, even with the misspelling, lol. 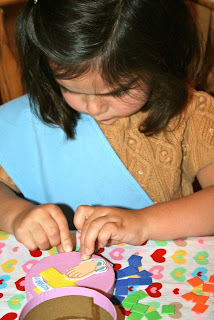 I am totally going to check out those links for the coloring pages. Those are adorable. Right now I have to go listen to Lily recite some Shakespeare though! Now I see how sweet it can be even with a smaller group =) It was good for me to see this! If you honest to goodness meant it, I would be happy to proofread your pages - it's my "day job" (2 mornings a week) for our little local newspaper. It's so much more difficult to proof your own work - you know what it's supposed to say! I've been an occasional popper-inner here for a while and finally gave up and subscribed a few weeks ago. I only have one little girl but am hoping for more, so the LF group is fascinating to me. Thank you for all the resources you post! Anyway, if you're really interested, feel free to e-mail me at nettacow at gmail dot com. I'll subscribe to the comments, too, so leave me a note if you do in case it gets caught in spam. Blessings! I just wanted to say I love the outfit your little Chiquita is wearing. Thanks for the posts on Little Flowers. We don't have a Little Flowers group in my area. But we have 6 daughters 3 of which are old enough to do this so we have a really small group. So happy that the cookies arrived safe and sound and worked out for the rosary! Hoping that they were a yummy treat! My girls were soooooo bummed to not get to come, but have been working on some of their little projects today! You'll have to let me know which cds you ordered and how you like them. I'm anxious to add a couple to our collection. This is such a sweet lesson! Our second meeting is tomorrow. We can't wait. little people nativity also at toyrus!! Just keeping these ideas for when Mary is old enough!! I've seen the cupcake rosary's before, but your cookie one I think I'll try. My Sunday school class seems to always want to eat. Being the month of the Rosary, think I'll do that this Sunday.